2-21-12: The church I work at has a Pancake Supper tonight: 6pm @ Prospect Park United Methodist in Minneapolis; come to Fat Tuesday! Would you cook with this woman? 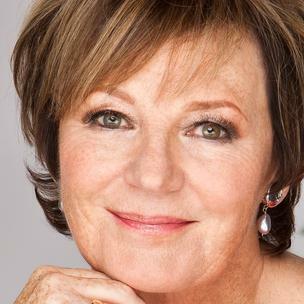 Meet Delia Smith. Way back in the ’70s (was it that far away? ), you only had to tune in to the telly to learn how to make pastry (or lots else) with Delia in London or Edinburgh. For grins, scroll down to the bottom of the post and click on the video and see what the buzz was about. 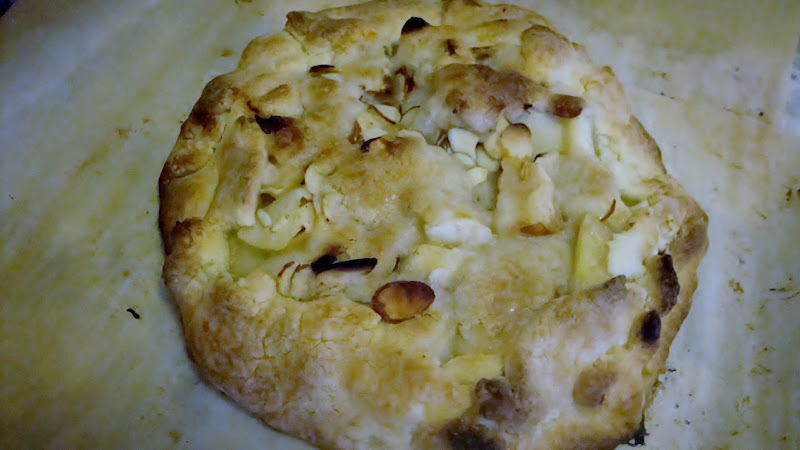 Could you bake a blind tart shell after watching that television program? I admit I missed Julia a bit as I watched! After a couple of false starts as a hairstylist and travel agent, and without much education, Delia began reading cookbooks in the reading room at the British Museum. Not long after, she was cooking and writing for the Daily Mirror starting in 1969, where she met her husband, Michael Wynn Jones. 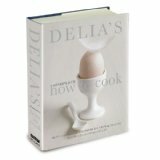 Many television episodes, newspaper articles, books (21 million sold), a website, and even a soccer club later, Delia continues to deliver basic, commonsense, always-trusted cooking advice, recipes, and technique. She’s so successful at delivering the goods that, within the world marketplace, there’s now something called “The Delia Effect.” Which means it’ll sell like the proverbial hotcakes, as her stamp on anything makes product fly off the shelves in the UK. Reportedly, egg sales in England rose by 10% after her book How to Cook was published. Delia’s Complete How to Cook can be ordered through amazon.com, as can other volumes, though some appear to be more available overseas than here in the States. Time for a few days in London, I’d say. Reading through recipes and trying to decide which to try for this blog, I found no shortage of tasty and wonderful-sounding things to cook. Oven-Baked Smoked Pancetta and Leek Risotto caught my eye, as did Grilled Venison Steaks with Red Onion, Grape, and Raisin Confit, a selection from Delia’s website under the banner, “What Should You be Cooking This Month?” There’s also a tab for ingredients and the available recipes to use them. 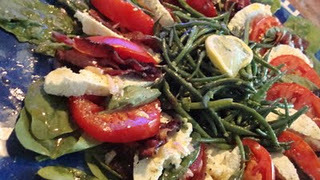 Special diets, Under 30 minutes, Freezing, and Cooking for One are just a few of the sections you might want to peruse on the site. I especially enjoyed “Recipe of the Day” and “Competitions.” At the very bottom are links to lists of recipes like, “French,” “Pasta,” and so on. 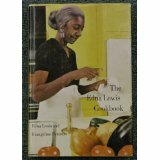 While it might not be true, the website has every indication of containing a good portion of her thirty-plus years’ recipes and information, which makes it a treasure trove, to say nothing of a great value. 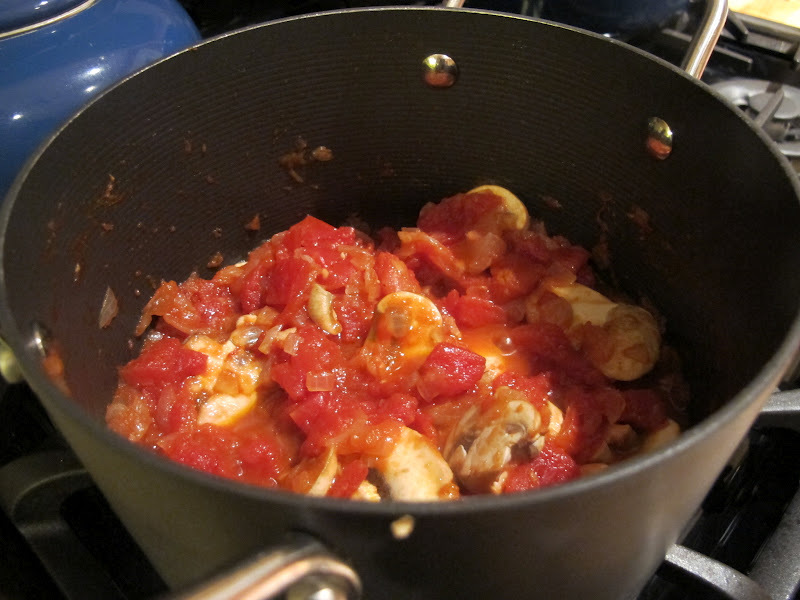 First: Make a little marinara with mushrooms. 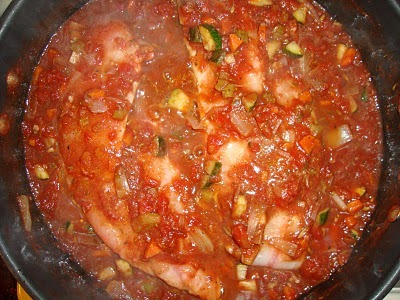 Start by making a good, thick tomato sauce: heat the olive oil in a saucepan and fry the onion for about 5 minutes. Now add the garlic and tomatoes. Season with salt and pepper, then bring to a simmering point and cook gently, uncovered, for 15 minutes, stirring occasionally. Next add the sliced mushrooms, making sure they are well stirred in. 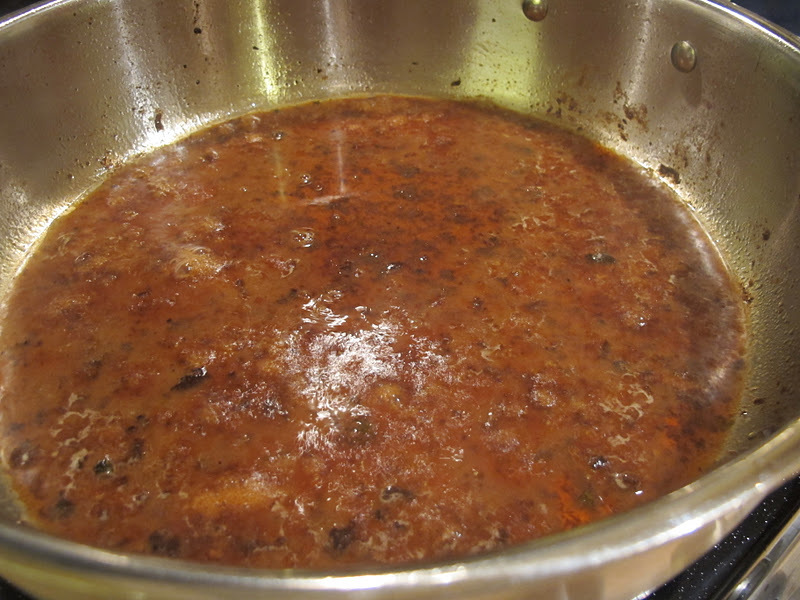 Simmer for a further few minutes until it looks like a thick sauce. Lastly, stir in the fresh basil and chopped capers. 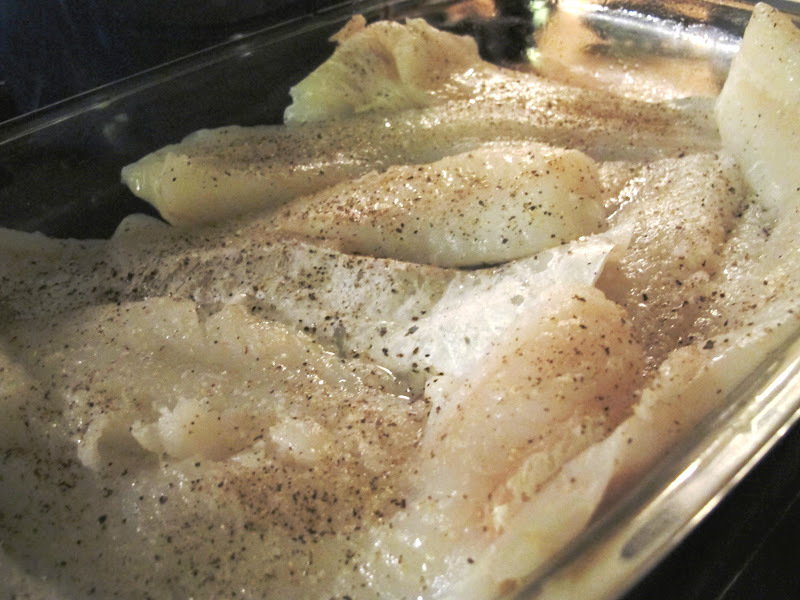 Now place the fish in a shallow baking dish or tin, season with salt and pepper and sprinkle a little lemon juice on each piece. Next spoon an equal quantity of the sauce on to each piece of fish and arrange a few olives on top. Cover the dish with foil and bake on a high shelf (in upper 1/3 of oven) for about 25 minutes, depending on the thickness of the fish. 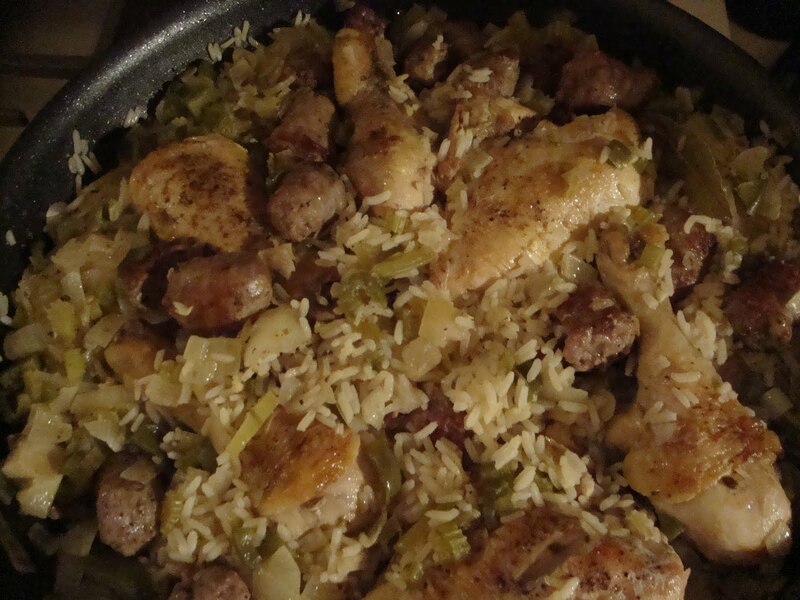 Serve with new potatoes or brown rice and a tossed green salad. 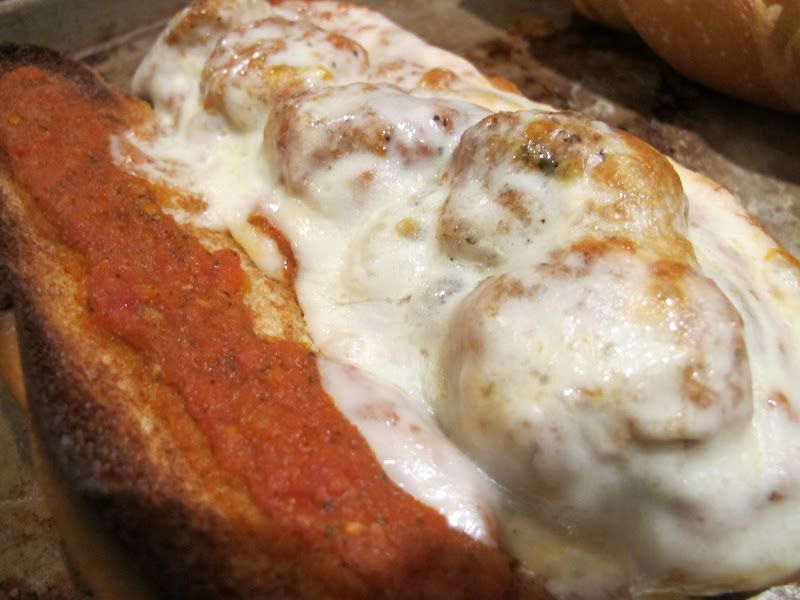 Last, top with marinara, and bake. 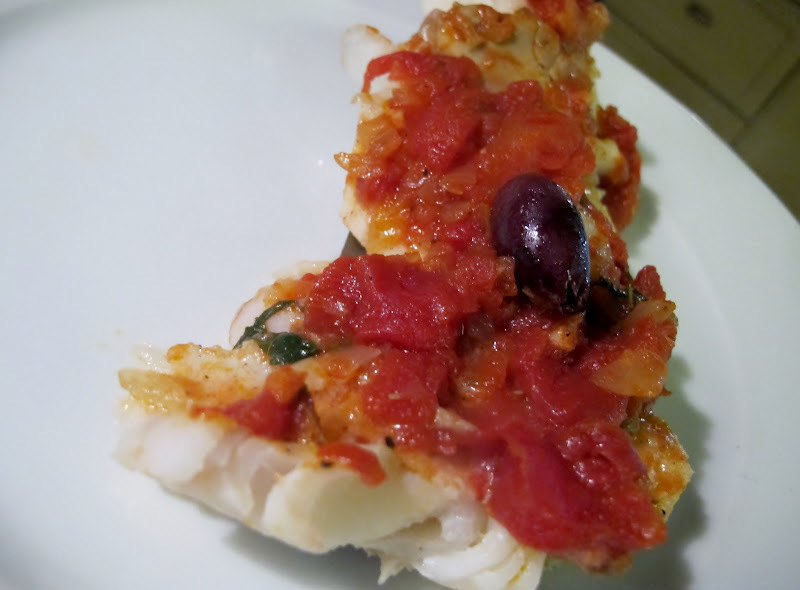 I sometimes cook fish right down in a chunky tomato-onion-garlic-etc bath either on top of the stove or in the oven; you might try that idea if it appeals to you. Here’s my fast snapper in tomato sauce. Get your vegetables, honey. 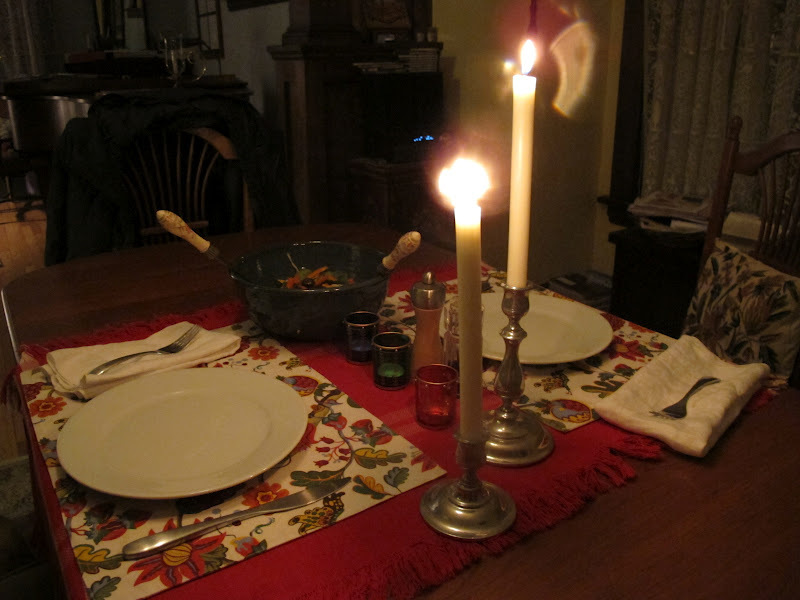 What’s on Alyce’s blog about cooking for one, Dinner Place? 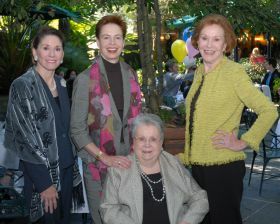 Part of a large restaurant family, Ella Brennan began as a teen in the business with her brother Owen at Brennan’s, home of the famous “breakfast at Brennan’s.” She went on to travel the world to learn about great food and better service, returning home to put the knowledge to work building one successful restaurant after another. Not only that, she brought the tourists home with her, putting New Orleans on the map as a center for food and some say the most beautiful restaurant experience available in the United States. After the family bought The Commander’s Palace in 1969, Brennan proceeded to hire and train chefs who went on to be famous in their own right, among them Paul Prodhomme and Emeril Lagasse. Business woman and lover of perfect meals, she was an expert in the world of food though she never cooked at all. 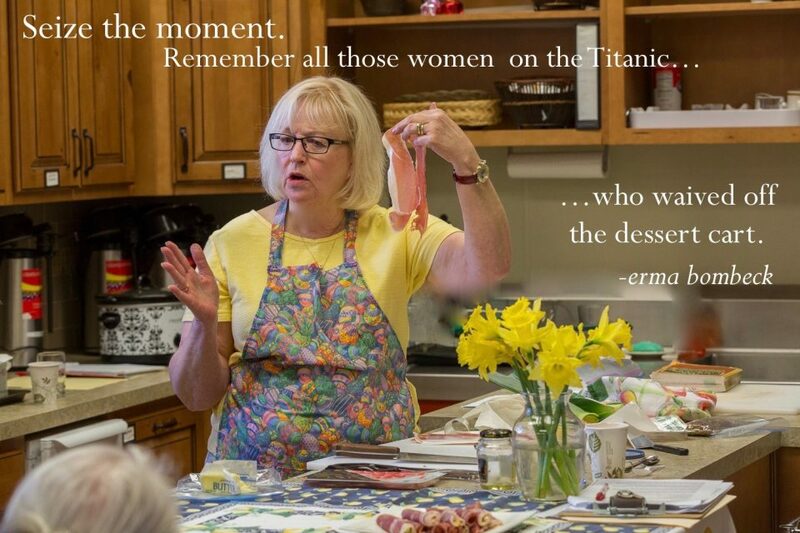 “I never took to the kitchen,” she says. My thought is she never needed to “take to the kitchen,” with the kind of talent she hired. 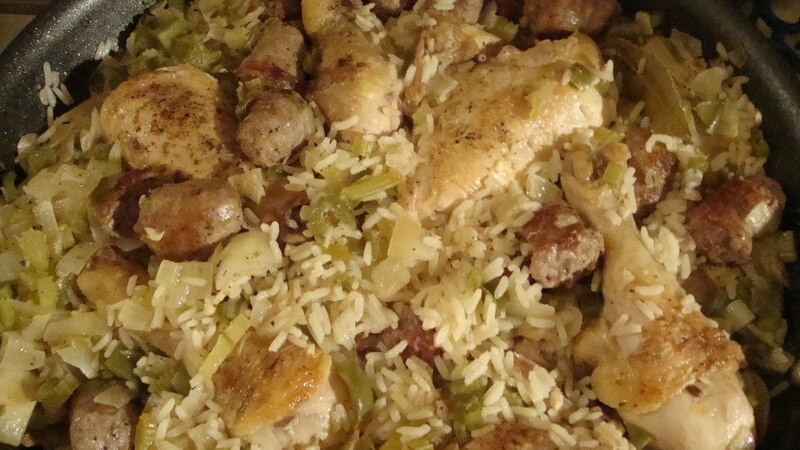 Order a copy of The Commander’s Palace New Orleans Cookbook here. Read all about The Commander’s Palace or make a reservation. 25 cent Martinis if you go! Invite friends. What fun! This makes a huge pan of bread pudding. 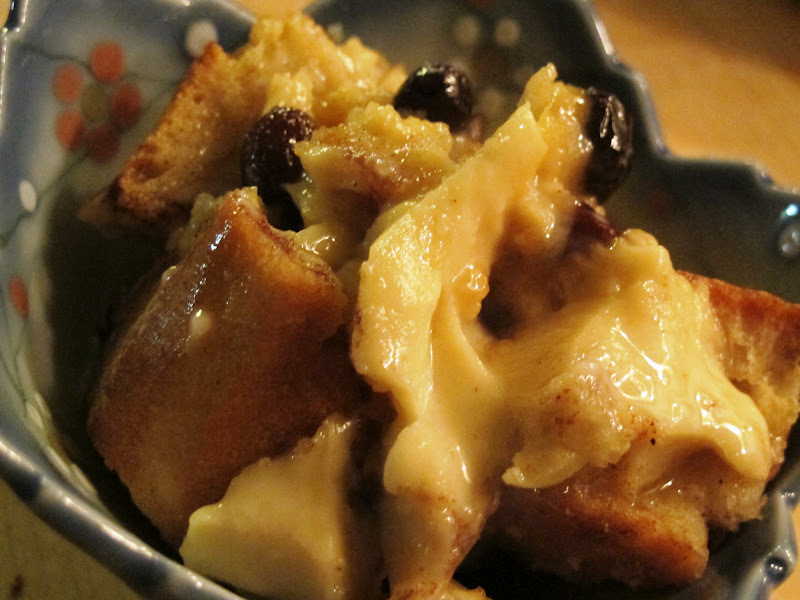 Creole Bread Pudding is the most soul-satisfying taste of all. But do it right. pudding, I watched her eyebrow go up as she discovered a morsel of dry bread. walked by, Mom pointed to the dry morsel. She didn’t have to say a word. 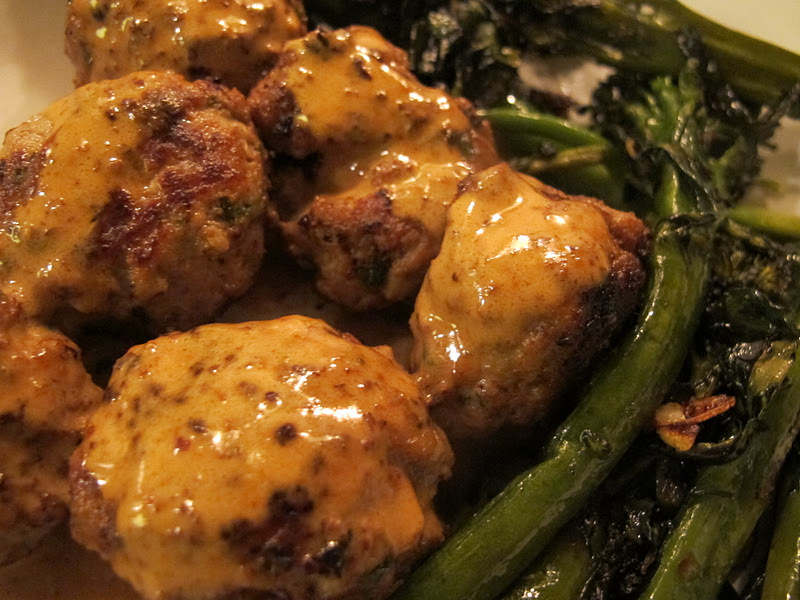 Cook’s Note: Make Whiskey Sauce (recipe below) while pudding bakes; it must cool. Fyi: The Bread Pudding Soufflé is served in ramekins with meringue and hard sauce. 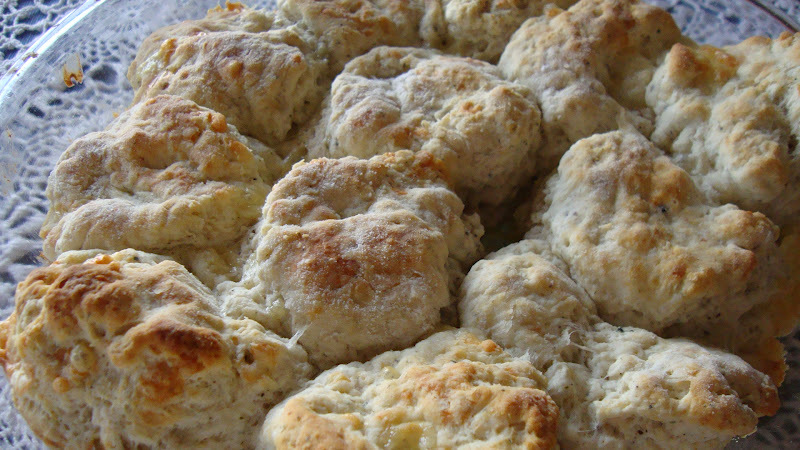 –Preheat oven to 250 degrees F.
–Butter a large (11 x 8 1/2 x 3 inches) casserole dish and set aside. (Once in the oven, the casserole will sit inside a large pan. A roasting pan would be good.) Mix the eggs, cream and vanilla in a large bowl, and combine the sugar, cinnamon and nutmeg in a separate bowl. This helps to evenly dis- tribute the spices. 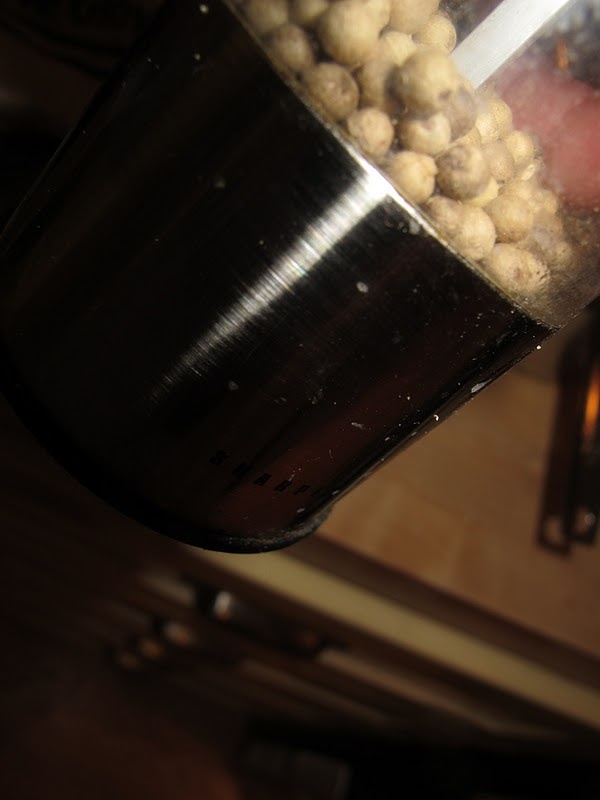 Add the sugar mixture to the egg mixture, and combine thoroughly. –Cover the casserole with foil, place in a large dish (the roasting pan, if that’s what you decided to use) partly filled with hot water, and bake for 2 1/2 hours. 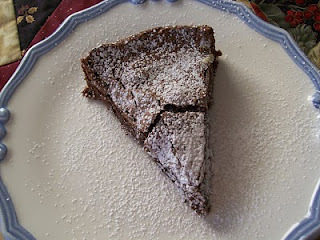 Remove the foil, and increase the oven temperature to 300 degrees F. Bake for 1 hour more, or until the pudding is golden brown and slightly firm. Use a spoon to make sure the custard is fully cooked; it should be moist but no longer runny. If you’re unsure whether it’s done, remove it from the oven and let it cool while it remains sitting in the water bath; the carryover effect will keep it cooking. 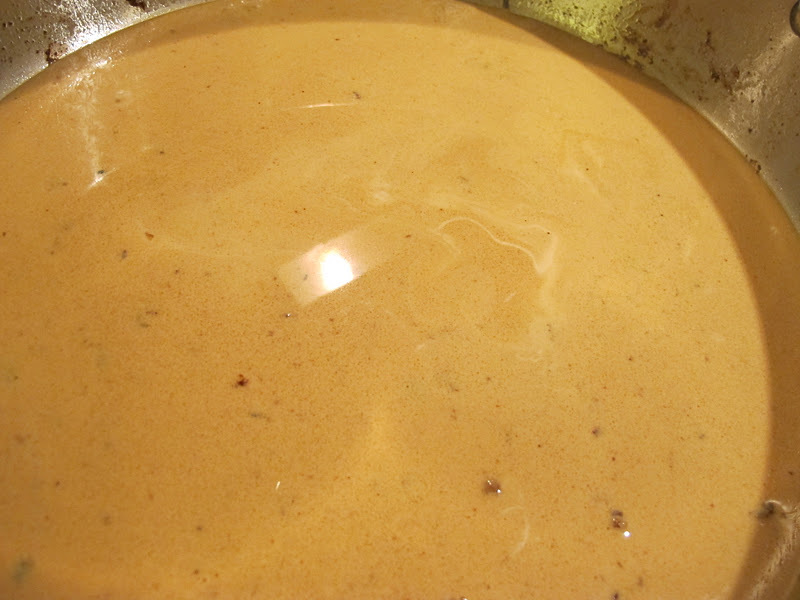 · For the whiskey sauce: Place the cream in a small saucepan over medium heat, and bring to a boil. Whisk cornstarch and water together, and add to cream while whisking. Bring to a boil. Whisk and let simmer for a few seconds, taking care not to burn the mixture on the bottom. Remove from heat. Stir in the sugar and bourbon. Taste to make sure the sauce has a thick consistency, a sufficiently sweet taste, and a good bourbon flavor. Cool to room temperature. *4oz of French bread is a bit less than 1/4 of the baguette I got from Whole Foods, which seemed like way too little bread to me; it didn’t cover half of the bottom of the casserole. Typo in the recipe? Wrong kind of bread?? I increased the amount to approximately 12 ounces; my baguette was 15 oz. total. 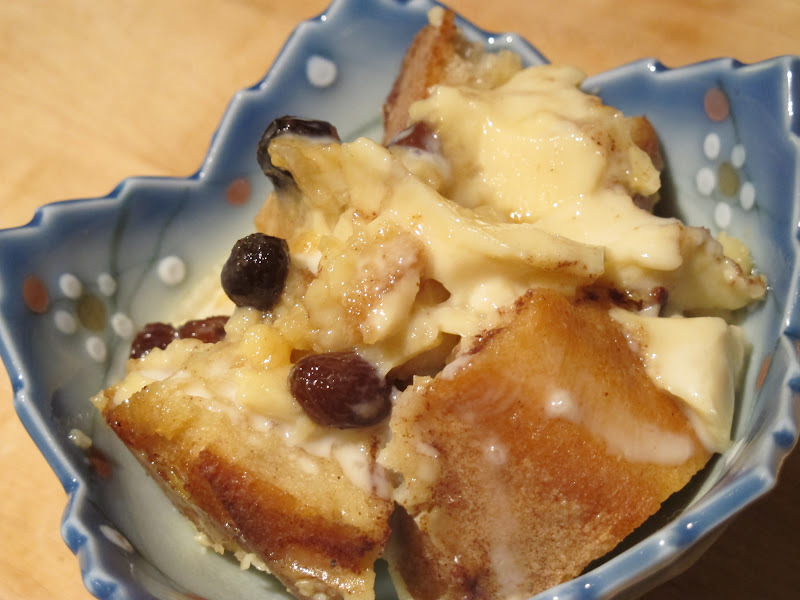 I don’t make bread pudding from a recipe usually; I just combine milk, eggs, and nutmeg and sweeten it to taste–which isn’t nearly as much sugar as this recipe calls for. I did leave the amount of sugar the same in order to try and get a true test of the recipe. It was the right thing to do! What if you wanted beautifully written recipes, tastefully conceived, and perfectly photographed–all from home cooks–for home cooks? What if you wanted those cooks to have worked professionally (catering, restaurants, magazines) and to have traveled the world so they could bring the best dishes back to you? Enter Canal House Cooking, La Dolce Vita, #7 in a series of self-published volumes from a multi-talented duo who have worked at food, cooking, and food writing/photography most of their lives. After leaving behind the corporate publishing/food world in order to spend more time at or near their homes in New Jersey and Pennsylvania, Melissa Hamilton (above, right) and Christopher Hirsheimer (above, left; she’s a she) began cooking together daily in a warehouse and keeping a record of it. Out of that commitment comes this lovely, popular series of books that is their gift to those of us in the home-cooking “business.” An article from WSJ tells the story more thoroughly here. To really get to know these women a little more, watch an enchanting tiny video about them and their food in Italy (basis for the most recent book)….Here. 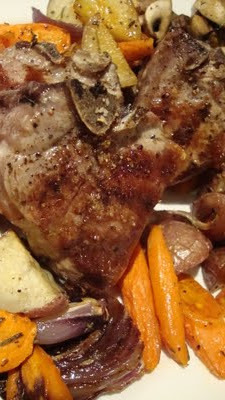 And, when you’re done reading and watching, it’s time to cook with Melissa, Christopher, and me…. 1. 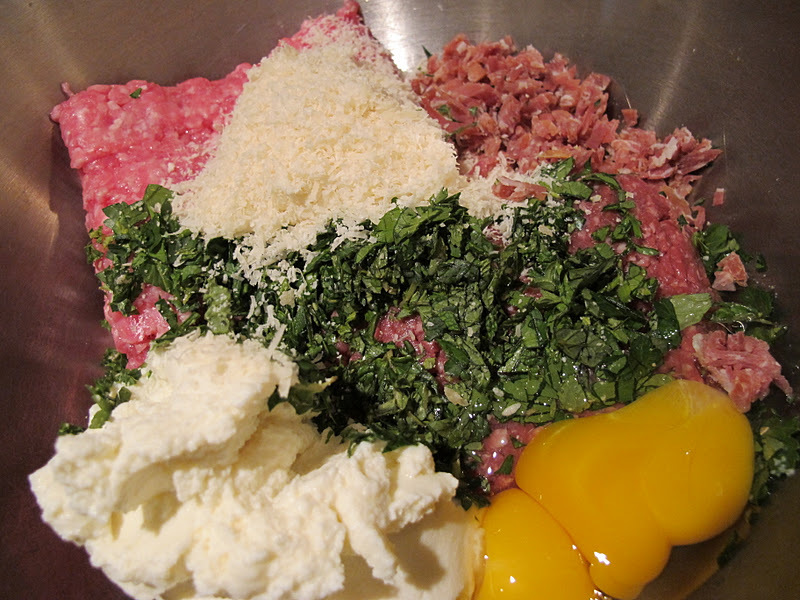 Mix together the pork, veal, prosciutto, ricotta, pecorino, eggs, mint, parsley, nutmeg, and pepper in a large mixing bowl. 2. 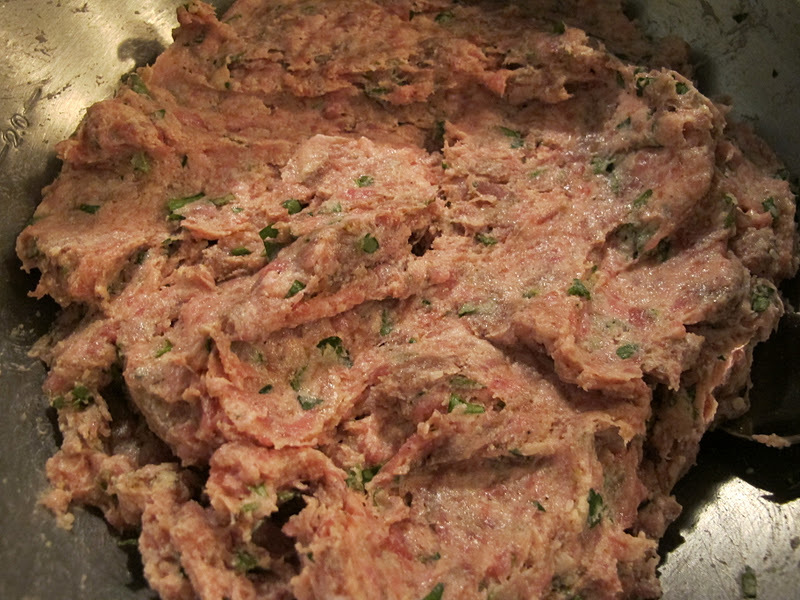 Use a large soup spoon and scoop up about 2 ounces of the meat into your hand and roll into a ball. 3. 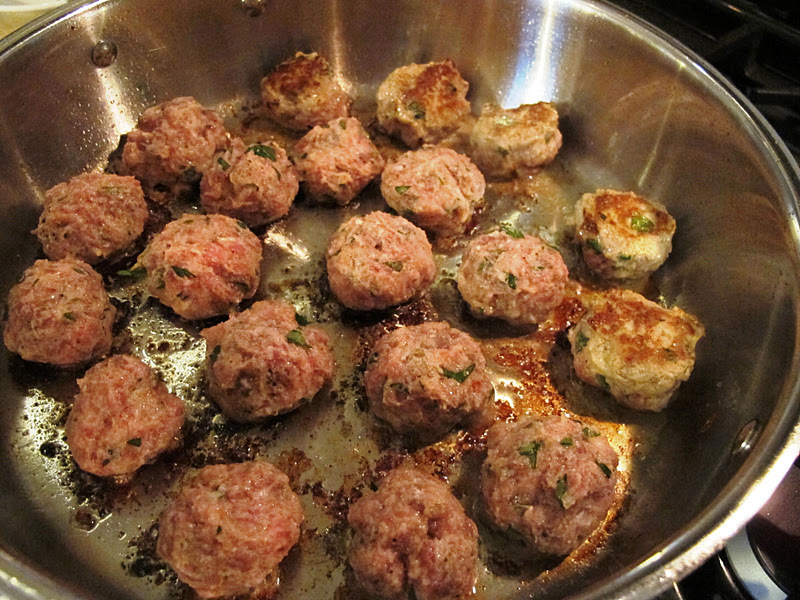 Make all the meatballs the same size so they will cook evenly. 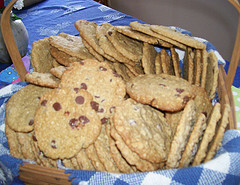 As you make them, arrange them in a single layer on a baking sheet. You can do this a few hours ahead, cover with plastic, and refrigerate until you are ready to cook them. 4. Heat 2 tablespoons of the oil in a heavy large skillet over medium-high heat. Brown the meatballs in batches, about 15 minutes per batch, using two forks to delicately turn them over so that they brown on all sides. Add more oil if needed. Transfer cooked meatballs to a platter and cover with foil to keep warm. 5, Increase the heat to high and deglaze the skillet with the wine, stirring with a wooden spoon to loosen any browned bits stuck to the bottom of the skillet. Add the cream, if using, and cook, stirring, until the sauce thickens. *Pecorino Romano is, most likely, the pecorino (hard, often gratable sheep’s cheese) available in most American grocery stores. 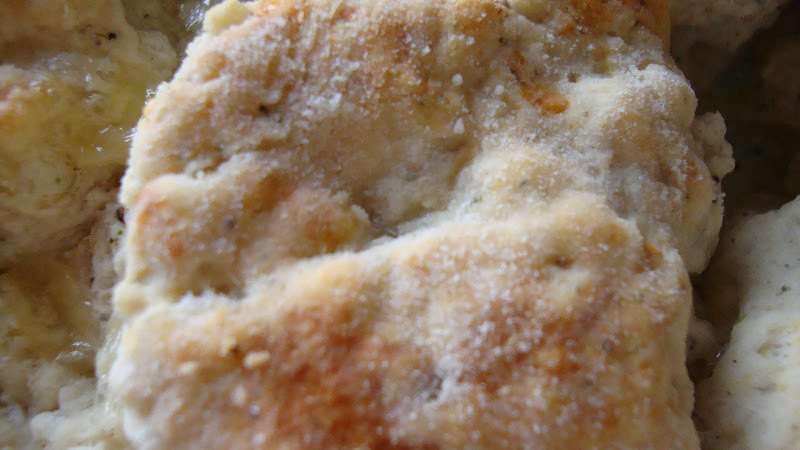 Milder and less expensive than Parmesan, it’s a happy addition to pasta or salads. 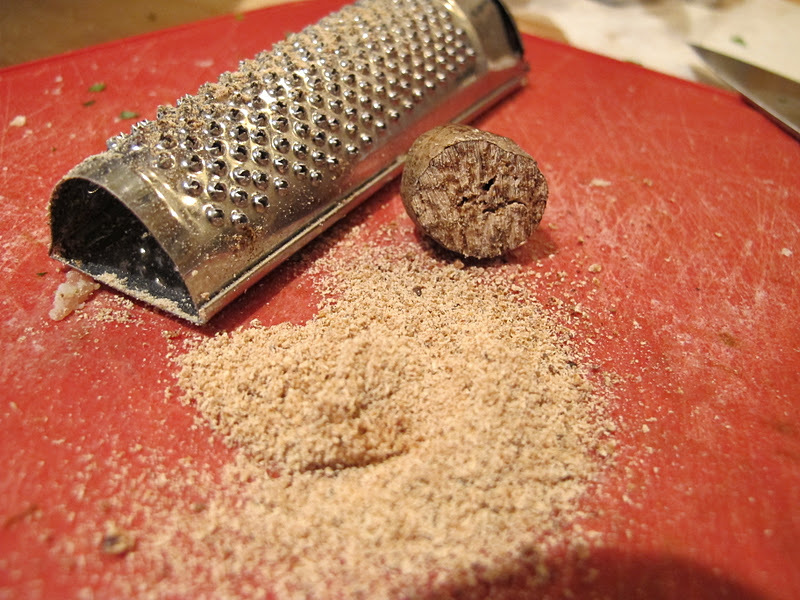 Cook’s Note: I made one meatball first and cooked it to test the seasoning; I had gone easy on the black pepper and had not added any salt at all. 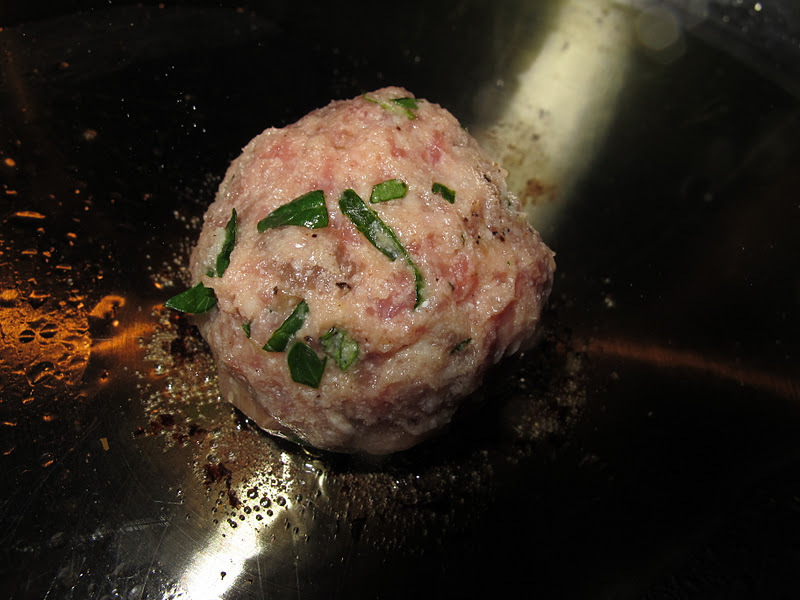 My thought was to maintain the freshness/lightness of the meatball so that the herbs weren’t overwhelmed. On tasting, I did add a bit more pepper and about 1/2 tsp kosher salt. The rest of the batch was perfect. You could do anything you typically do with meatballs with these, but I do think they’re special and complete all on their own. I served them with broccolini sautéed in olive oil with crushed red peppers and slices of garlic thrown in the last 2-3 minutes. 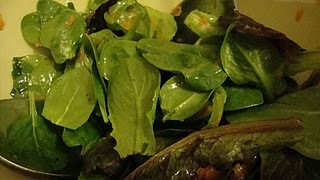 We started with a little very simple green salad. We rented a farmhouse in Tuscany —– a remote, rustic old stucco and stone house at the end of a gravel road, deep in the folds of vine-covered hills. It had a stone terrace with a long table for dinners outside, a grape arbor, and apple and fig trees loaded with fruit in the garden. There was no phone, TV or Internet service, just a record player and shelves and shelves of books. 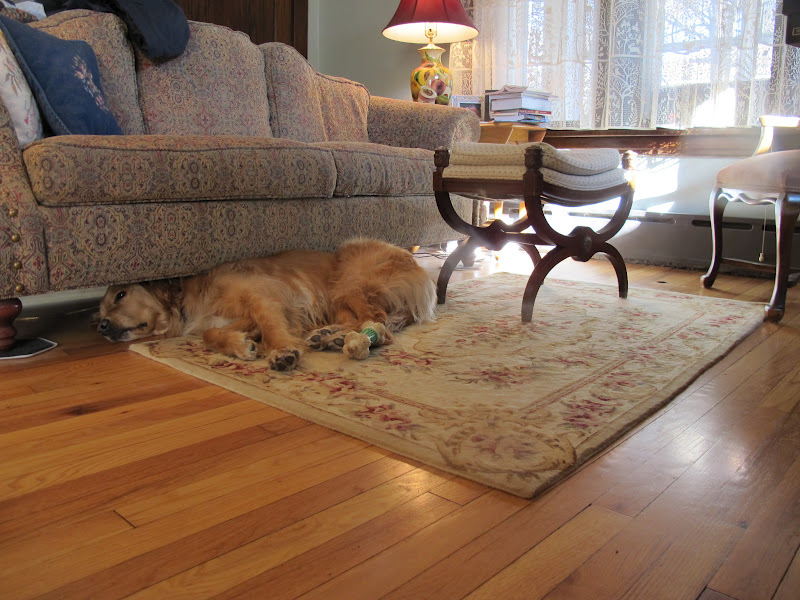 It had a spare, simple kitchen with a classic waist-high fireplace with a grill. 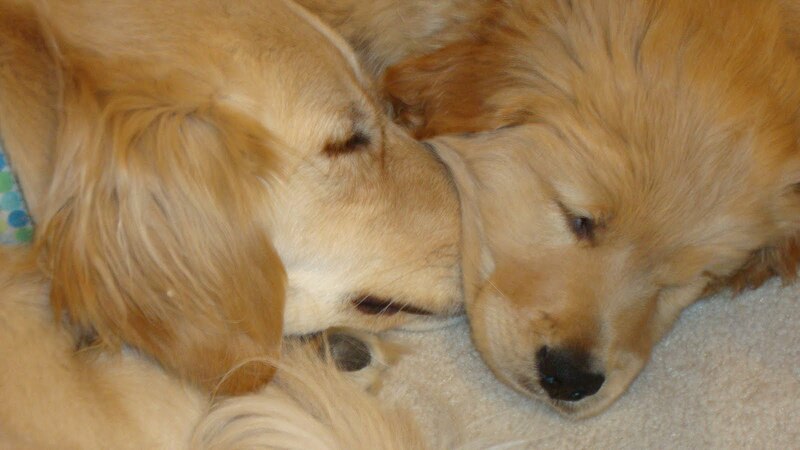 It was all we had hoped for. It was our Casa Canale for a month. Back in the states, Melissa and Christopher are eating lunch together every day as they take a break from cooking, working, and writing. 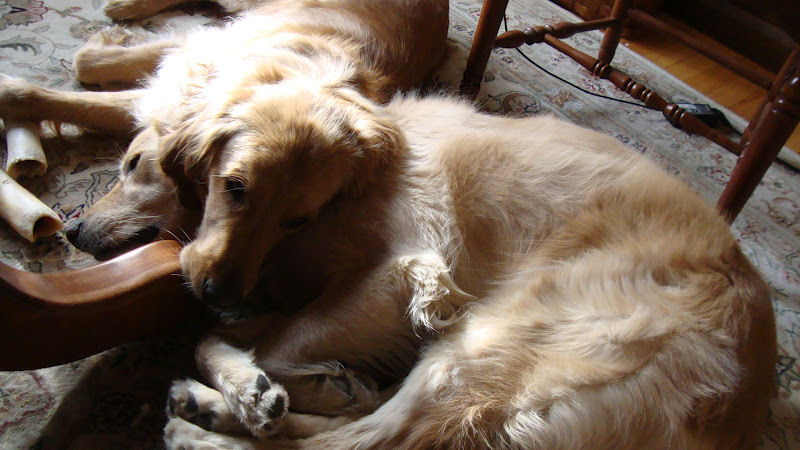 Read their blog that chronicles those noon-time meals. Listen to their interview on edible radio. Want to cook more food from Canal House? 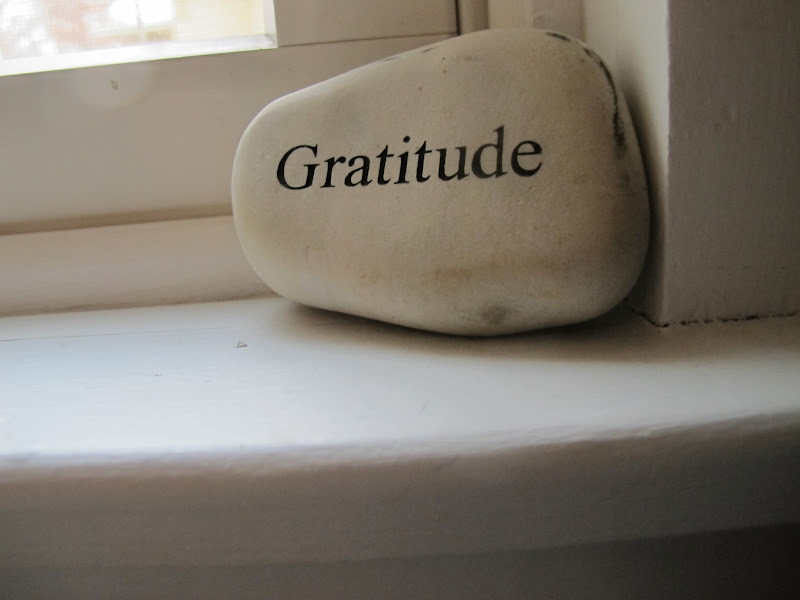 You can do it if you…. If you liked this, you might like my Bacon-Caprese Salad with Fresh Cheese. 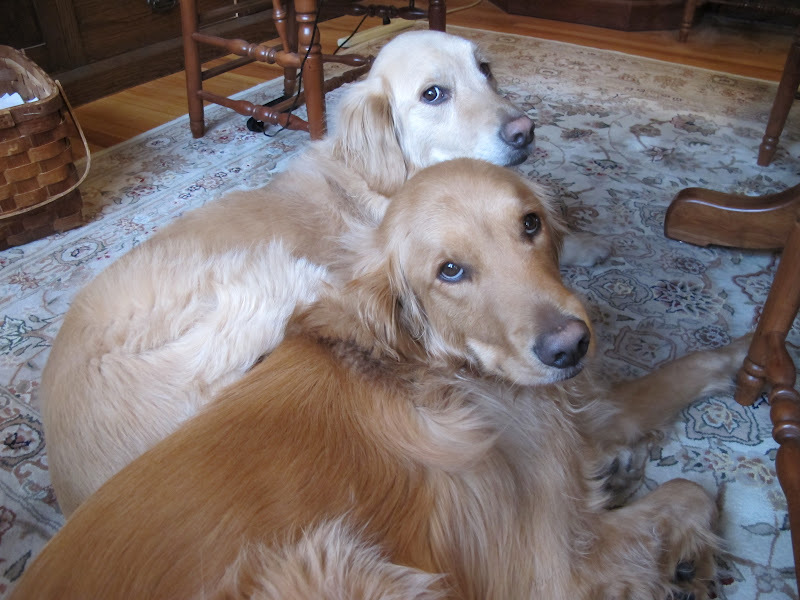 Two-Dog Kitchen and Around the ‘Hood return soon…Woof from Gab and Tuck. 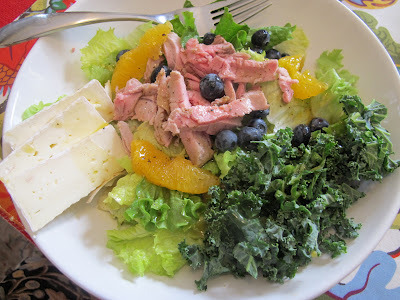 Food photos: copyright Alyce Morgan, 2012. 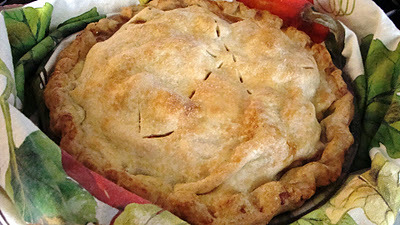 Recipe, book and author photos courtesy Canal House.